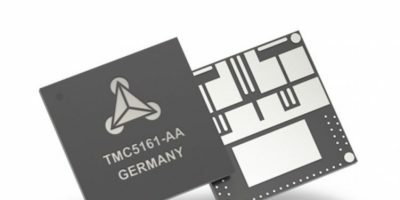 Extending its cDriver ICs, Trinamic has added the TMC5161 IC. 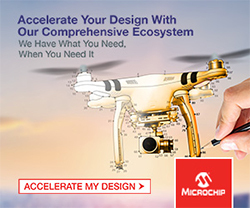 It has an integrated motor controller and driver for two-phase stepper motors up to 3.5A RMS and 8.0 to 40V. The company describes the TMC5161 as a building block with a powerful integrated MOSFET driver stage and complete motion control features, including current regulation. “It achieves a new maximum for motor voltage and current specs in a monolithic motion controller with integrated MOSFETs,” explains Michael Randt, founder and CEO of Trinamic. 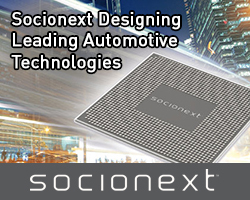 The IC enables stepper motor control that negates the need for specialised motor control expertise, says the company. The chip can be set up and evaluated easily using Trinamic’s free of charge TMCL-IDE software and the modular evaluation kit. This minimises development time and also allows engineers to quickly try out different parameters for the optimal result, including Trinamic technologies that are in high demand such as SixPoint ramping, StealthChop2 and StallGuard2. The cDriver covers a wide spectrum of applications from battery-powered, high efficiency systems to embedded applications, and used applications as diverse as robotics and industrial drives, textile, lab and office automation, medical drives, and next-generation desktop manufacturing applications. Available from end of December from Trinamic’s distributors, the TMC5161 is supplied in a compact 10 x 10mm² QFN package. The cDriver will also be offered as an evaluation kit and breakout board for quick evaluation and parameterization. Trinamic Motion Control develops technology for motion and motor control applications. 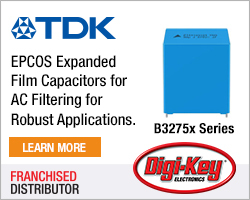 It produces ICs, modules, and mechatronic systems to enable software engineers to quickly and reliably develop precise, smooth, quiet and efficient drives. The company is headquartered in Hamburg, Germany with a research centre in Tallinn, Estonia, and sales engineers in Chicago, USA and Suzhou, China.